THE MAN WHO randomly killed a Cleveland retiree and posted video of the crime on Facebook shot himself to death today in Pennsylvania, police said. 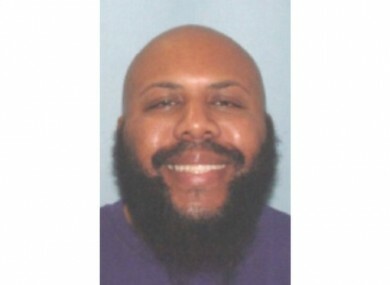 Pennsylvania State Police said Steve Stephens was spotted this morning in Erie County, in the state’s northwest corner. Authorities say officers tried to pull Stephens over and, after a brief pursuit, he shot and killed himself. He was wanted on an aggravated murder charge in the shooting death of a 74-year-old man who was picking up aluminium cans on Sunday after spending Easter with his family. Stephens, 37, shared a recording on Sunday of himself announcing his plan to kill someone, then two minutes later posted another video of himself shooting and killing Godwin, Facebook said. A few minutes after that, he went live and confessed, the company said. Law enforcement officials said yesterday that his cellphone was last tracked Sunday afternoon in Erie, Pennsylvania, about 160 kilometers east of Cleveland. Email “'Facebook murderer' shoots and kills himself during police chase”. Feedback on “'Facebook murderer' shoots and kills himself during police chase”.